This is the Indie Exclusive Very Limited to 1,500 copies pressed on Maroon Vinyl LP and includes a full album size full color picture lyrics booklet and digital download. 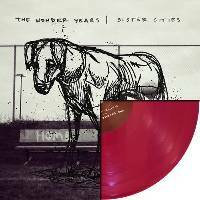 Philadelphia natives The Wonder Years return with their new studio album Sister Cities, a collection of testimonials on love, loss, and finding commonalities in the human experience despite cultural differences. Produced by Joe Chiccarelli (Manchester Orchestra, Morrissey, The Strokes), the album expands on the band's unique brand of emotional rock that has gained them a massive cult following since their start in 2007. Sister Cities is the follow up to 2015's No Closer To Heaven, an album that debuted at No. 12 on the Billboard Top 200, No. 1 on the LP Vinyl Albums Chart and went on to sell over 45,000 units in the U.S.